A trial balloon recently floated by incoming President-elect Barack Obama’s transition team raised the possibility of combining the U.S. military’s space capability and funding with NASA’s. An intriguing option that raises numerous possibilities that could help advance the civilian and military uses of space, but one that also warrants a close examination of the resulting structure and end game. Before then President Dwight Eisenhower decided to unify disparate resources in the American rocket community including those of the Army and Navy there were many competitive projects and much political infighting that didn’t provide the expected rivalry for success that had become the American way of getting things done. That spirit of competition and the political impediments should have come as no surprise. Each branch of the service nearly up until this day has insisted on different equipment to conduct its operations and missions using different contractors and assets with different criteria, but ultimately required to perform the same or similar function. For example, different planes for each service has increased costs while offering only a marginal operational difference and increasing the support costs by maintaining training, parts and staff on such a diverse fleet of assets. Defense economics dictates that the more copies of an item you produce the lower the cost each subsequent unit becomes. Even after rocket resources were combined under NASA the Air Force quickly marched down a path to put into orbit its own trained crews in orbiting laboratories and reusable winged space vehicles launched atop the same missile family that was being used to launch satellites and ICBMs. The reusable vehicle and orbiting space station strategy were at least a decade or two ahead of NASA’s, but NASA’s charge was one of achieving a specific goal of landing a man on the moon while the Air Force’s goal was achieving and operational capability of protecting the space boundary in low-earth orbit. In many ways it was NASA’s greatest triumph that has handcuffed its ability to create an efficient, sustainable, reliable, repeatable manned space program. 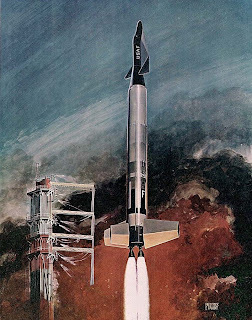 The early Air Force strategy of Dyna-SOAR and Manned Orbiting Laboratories (MOL) would have created parallel paths to space which would have benefited both programs over the long-term. The aggressive and ambitious program that the Air Force laid out was eventually canceled as the all-hands on deck approach to get a man on the moon required precious resources to meet Kennedy’s timeline and two competing programs couldn’t survive, but had it survived and had it been continually refined we would have had a post-Apollo platform to leverage to take America to its next steps in space. Instead, in the post-Apollo era costs became the critical factor in the space program and since the Air Force had not continued its program and NASA was ending the use of assets and learnings gained from Apollo it would turn out that both programs would end up empty handed at a time when the Soviets while failing to reach the moon had in place the foundational components of a reliable space program. In the development of the Space Shuttle and early shuttle missions NASA and the Defense Department tried again to combine resources. The Pentagon was to be the largest customer of the Space Shuttle’s satellite delivery capabilities. The Air Force had even gone as far as to build a launch facility at Vandenberg Air Force Base to launch classified shuttle missions to deploy and service military spy satellites using Air Force trained crew. The Vandenberg site was required to maintain both a higher level of secrecy and a better launch window for polar orbits that are optimal for most spy satellites. Various reasons led to the abandoning of that strategy including the difficulty in maintaining a robust shuttle launch schedule due to operational constraints in the shuttle program, problems with the construction of the launch pad at Vandenberg and ultimately the loss of Challenger moved military payloads back to expendable rockets. So what has history taught us about combining our civilian and military space endeavors? Many have speculated that the ex-military laden NASA would lean heavily towards a “militarization” of space, other say that the two organizations will never get along and never agree on common objectives. Perhaps, but in the end it comes down to two critical factors. The same two factors that have plagued both programs since their inception: Money and Strategy. In the early sixties NASA had all the money it needed to achieve its goal of landing a man on the moon and returning him safely to the earth, but it lacked a strategy for the post moon era and failed to create a vision of what would happen if the moon program were canceled due to political whim, economic constraints, waning public support or an accident in the program. Eventually, the lack of strategy crossed paths in the seventies with a lack of funding and NASA was left foundering and looking for a way to stay afloat. 1. Necessary capabilities of manned spaceflight. 2. Common hardware that can be leveraged. 3. A common strategy and vision can be implemented on how to achieve and maintain a long-term sustainable manned space capability. 4. Agreement on a path to continually refine and improve hardware to steadily increase capabilities. 5. Specific capabilities to perform specific missions and functions, but not a one size, multipurpose approach. 6. Clear purpose and boundaries. The goal of combining resources should be to develop common platforms and vehicles, share the knowledge, training, support, resources and development costs, but also have a dividing line where each can have the proper assets to perform their missions and not be constrained by the other's missions or timelines. Some have argued that using the military and commercial Atlas or Delta launch vehicles are unsafe for humans to ride atop therefore leveraging assets is a waste of time and money. Any rocket is dangerous, but ultimately whether a rocket is carrying humans or a billion dollar satellite it should be safe and reliable. We shouldn't want to lose either. Bringing those vehicles up to man-rated standards is costly, but that can't be an excuse to develop yet another unproven and marginally capable alternative. The Russians have taught us that repeatable success comes from taking a rocket and refining it over time, but essentially producing the same configuration over and over. Repeatability brings reliability and an enduring success rate. Historic cooperation between NASA and the military has had a limited success record due largely to the conflict of mission, money and strategy. There is a chance that with the right leadership a combination of resources could create a better and faster space program. There is also a danger that other space powers namely Russia and China could see this combination as thin guise for militarizing space and a retreat from looking for international cooperation. Given both China and Russia’s past activities it is a risk worth taking. America has to take the lead once again in manned spaceflight and combining the resources of NASA and the military’s programs are a good step, but will require the right vision to execute. More of the same traps of the past and we’ll make little progress, but once again spend a lot of time and resources getting there.